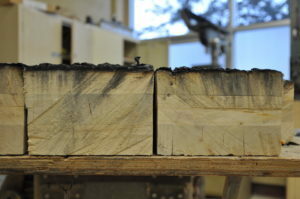 How do you demonstrate the fire resistance of exposed wood members using char methods in lieu of gypsum? Per IBC Sections 703.2 and 703.3, there are multiple ways to demonstrate fire-resistance ratings of structural members and assemblies. One method noted in Section 703.3 is to calculate the rating in accordance with IBC Section 722. For calculated fire resistance of exposed wood members and decking, IBC Section 722.1 references Chapter 16 of the American Wood Council’s National Design Specification® (NDS®) for Wood Construction. This chapter gives a nominal char rate of 1.5 inches of wood thickness per hour of fire resistance. Using the calculations and information contained in NDS Chapter 16, a fire rating of up to 2 hours can be calculated. The 2015 NDS allows calculated fire resistance of a number of wood products, including solid sawn lumber (this includes nail laminated timber), glue-laminated timber (glulam), laminated veneer lumber (LVL), parallel strand lumber (PSL), laminated strand lumber (LSL), and cross laminated timber (CLT). For structural members using this method of exposed fire-resistance calculations, the effective char rate, which is slightly higher than the nominal char rate and includes a heat-affected zone, is used. For non-structural members such as blocking, the nominal char rate is used. Additional design considerations for certain structural members such as glulam beams, timber decking and CLT are presented in NDS Chapter 16. Adjustment factors applied to the allowable design properties of exposed structural members rated for fire resistance are also presented in this chapter. AWC’s Technical Report 10 provides background information for the established methods in the NDS, which can help both the designer and the Authority Having Jurisdiction in applying and evaluating this method. TR 10 also includes a number of design examples for exposed structural wood members utilizing the provisions of NDS Chapter 16.